LinkedIn first opened the publishing opportunity to 150 thought leaders such Richard Branson and Deepak Chopra before opening it up to everyone in 2014. This post is about how to use LinkedIn articles to gain more visibility. Now with the release of the new desktop interface, LinkedIn has renamed publisher to simply articles. Writing LinkedIn articles offers everyone on LinkedIn the opportunity to write long-form content catapulting their personal and brand awareness when done correctly. 1. Write about what you know and what you want to be known for. This is a great way to share your expertise by offering what you know to help others. 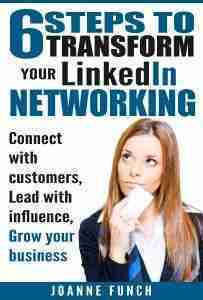 This builds your credibility in your niche and awareness to those in your network. LinkedIn advises your network when you post something new under the notifications tab. 2. Choose a catchy and meaningful headline. Your headline will make or break your article because its goal is to drawn people in. The headline is not a time to get cutesy. I recommend you include a keyword in the headline along with a few words describing what is in the article. Note: People love ‘How to” articles along with titles that have numbers such as 7 steps to something. I suggest you never add more than 10 steps as that might appear that the article is too long and I won’t take time to read it. Be sure to add where your image is from under your image when you upload it. 4. You can add other multi-media elements to your article to further enhance the content. This includes additional images, videos, podcasts, slides, tweets, and others by clicking the Add Multimedia icon. 5. Be conversational in nature when you write. You want people to engage with your article by leaving a comment. When someone does leave a message you will be advised via email. Best practice is to respond by acknowledging their comment as soon as possible. This is where the conversation begins and may generate a lead! 6. Promote your articles following the publication. You can do this by sharing them on other social platforms with a link back to your article. If you currently write a blog on your website, you are accustomed to sharing that content. Add relevant hashtags to your post and your social shares. 8. Your article shows up at the top of your profile. This is great because when you are viewing someone’s profile you can see immediately if they are a publisher! One strategy is to be sure you are engaging with the content of your customers and prospects. 9. Typically I would recommend you post your articles between 8am-4pm Monday through Friday. 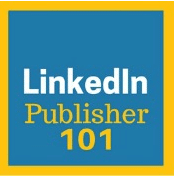 To improve your chances of your article being found be aware that your long-form post may be searchable both on and off LinkedIn, depending on your profile settings. Having your public profile visibility set to “everyone” will distribute your posts publicly. 10. Always end with two things; first, the last paragraph should tie your article in a bow with a conclusion around what the article was about. Second, be sure to have a call to action and an author’s bio. Don’t assume people who don’t know you will go back to your profile to learn more. Learn more about how to prepare a great LinkedIn marketing strategy for the coming year. 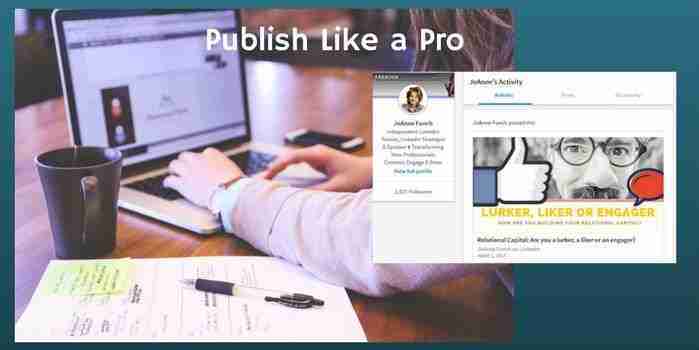 Want to learn how to rock the publishing platform to increase your visibility, connections and influence?